Venus in Scorpio's retrograde begins October 5 and runs through mid-November. Venus in Mars-Ruled Scorpio is the great and terrible Queen of Heaven in all her glorious battle array, ready to slay the forces of evil, or, on an earthier level: "Venus in Furs." 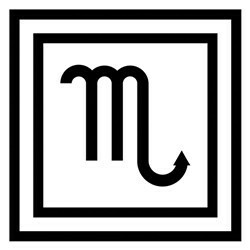 Jupiter in Scorpio super-sizes the drama and delight of this dynamic tension, heightened by delay to ecstatic union. If you have sick leave coming, you should use it so you can devote all your energy to navigating that narrow strait between the Scylla of sensuality and the Charybdis of carnality. Survive this intimate interlude with integrity.